Well, I always post about my outfits and this time I wanted to show you some beloved stuff. I am a very feminine girl that love being pampered and to try products. So I decided to with share my beauty products and any other goodies with you and I of course will express you my humble opinion! About perfumes, I am the kind of person that have lots of perfume at home and each day will use a different fragrance. Indeed, it depends of my humors. I will never have the same scent on me each day and I adore discovering other flavors. However, my favorites perfumes will never go out of my little perfumery. 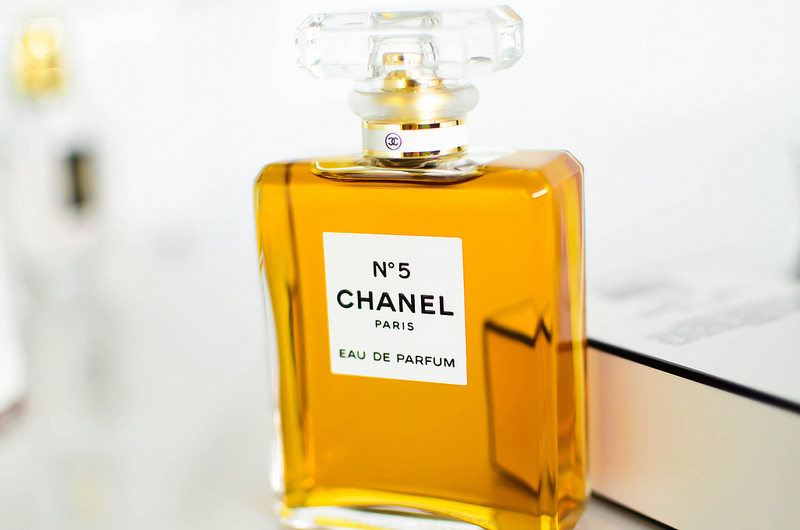 For example Chanel N°5 is one of the classic scents I love and always have. By the way, have you ever seen the new campaign with Brad Bitt guys ? Even it was something completely unexpected to have a man for women perfume I think it functioned very well! Don't you think so ? These new Burberry's boot are my best purchase I think! It's really comfy and totally great for fall/winter. 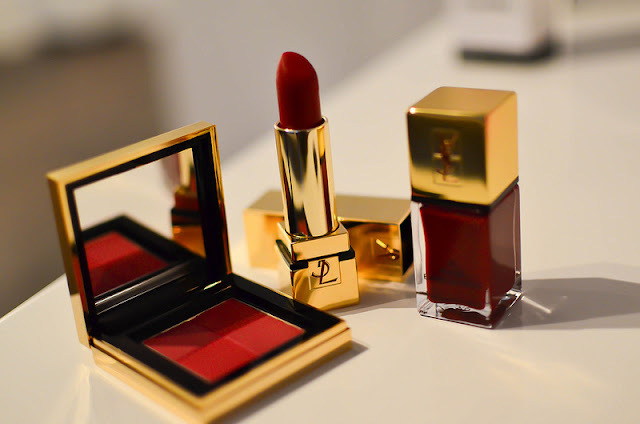 The limited edition make-up from Yves Saint Laurent is to die for. The brand has different shades of red lipstick for each kind of skin. I was looking for an elegant red and I am so happy to have found this lipstick "Rouge Pur Couture - The Mats N° 204". The nail polish "Rouge Expressioniste" and the "Blush Radiance N° 5" are the perfect combo with the lipstick to create the perfect red make-up look! This is the 1st time I tried Kiehl's products and I am strongly satisfied. 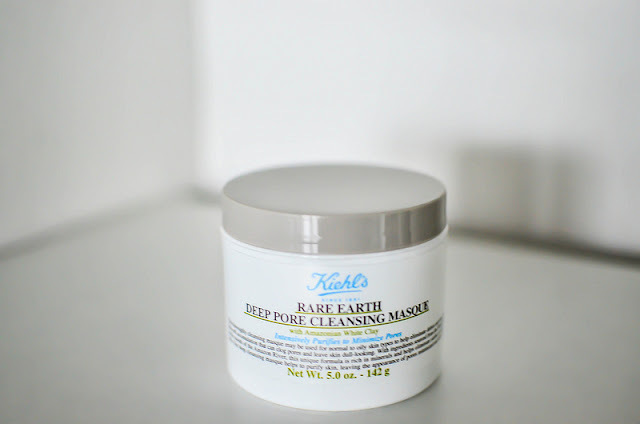 Two months ago, I bought this deep pore cleansing masque which contains Amazonian White Clay and believe me, it is the best masque ever. You only have to apply on clean skin and let get dry on your face. After ten minutes approximately you can remove with water. The result is a cleansed skin, pores minimized and skin refined ! The most of time, I do a basic make-up. I was used to applying the eyeshadow directly on the eyelids but after few hours the eyeshadow left (where are you ?? please come back I didn't finish the day or the night... hehe). Well, now the problem is solved!! 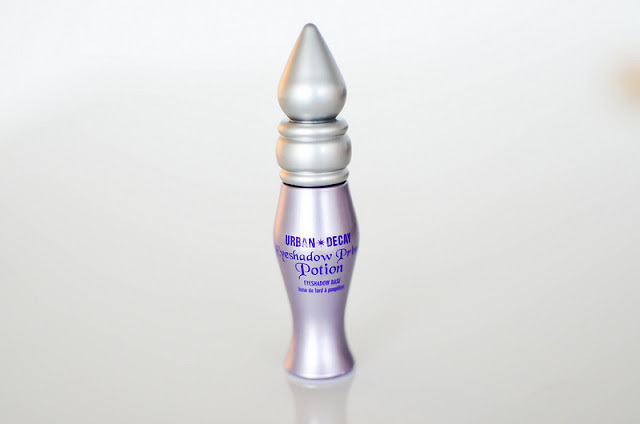 I discovered this eyeshadow primer potion (just like a magic potion!!) by Urban Decay that allows a long lasting of the eyeshadow. Isn't so cool ? I am completely addicted to. My hair is my life ! So, for me it's really important to take care. As I already told you, my hair is naturally curled but I love and prefer straight hair. And you know, the heat damage a lot the hair. That's why I try to apply a great masque at least once a week. 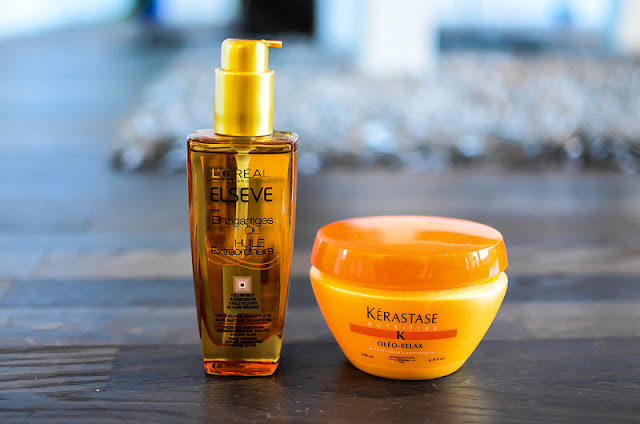 Currently, I am using the Kérastase Oléo-Relax. It's a bit expensive but I think if we want to have healthy, strong and shiny hair, we should invest in great products. Specially if you have thin hair as I do. Another product I found nice is the magic oil from l'Oréal. This one you can use daily to have the silky hair and even to protect against the heat. 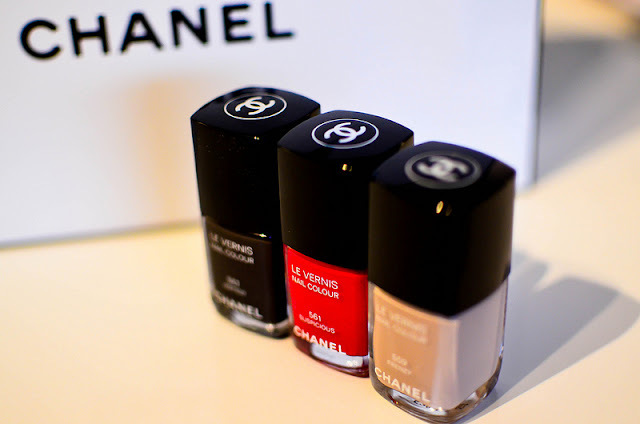 I am absolutely in love with these nail polishes from Chanel! I adore the dark vertigo, the red shade suspicious and the frenzy which is more delicate and soft! 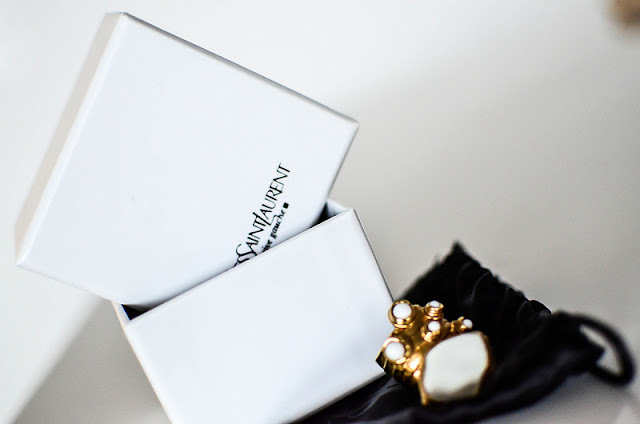 Arty white ring from Yves Saint Laurent I bought at the net-à-porter website! Simply gorgeous!! Hope you enjoyed reading this article guy!!! Love the lipstick and the nailcolours so much! I think the Chanel No. 5 perfume endorsed by Brad Pitt has worked really well introducing the male market! Although it's just him standing there talking for 30 secs lol! I love those burburry bppts! You are very classy!!! Chanel no 5 stays the best perfume ever! 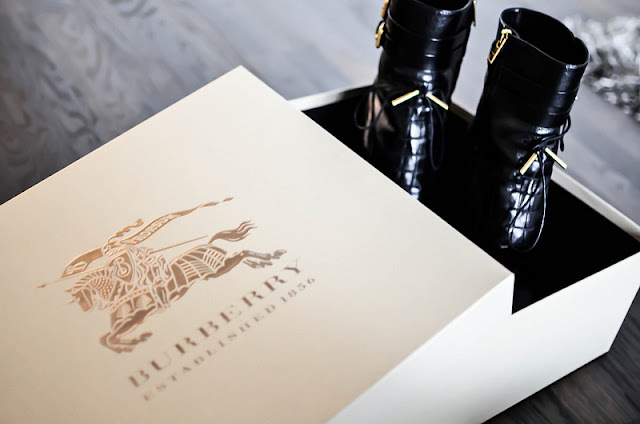 And love your new Burberry boots! You have impeccable taste :) Chanel No.5 always makes me think of such classic beauties like Marilyn Monroe. Thanks for write on my blog. I love your style and your blog. You´re so pretty! I´m following you on GFC. If you want to follow on bloglovin,twitter,facebook...Let me it know! I'm following you via GFC.. thanks for visiting me! YSL and Kérastase are my favourite too! :-) Nice pictures! Oh my some lovely stuff you got here. I like your outfit post and you look stunning. Thanks for the visit on my blog and i followed you on GFC. Hope to stay in touch. Beautiful products. I like having different perfumes for different days too and Chanel nail polishes are my favorites. Can't wait to see those boots! They look so gorgeous. OMG I would like to have them all!!!! thanks for the love hon, I'm following you now on all the same places! I adore this post... In fact, I love quality things like these!